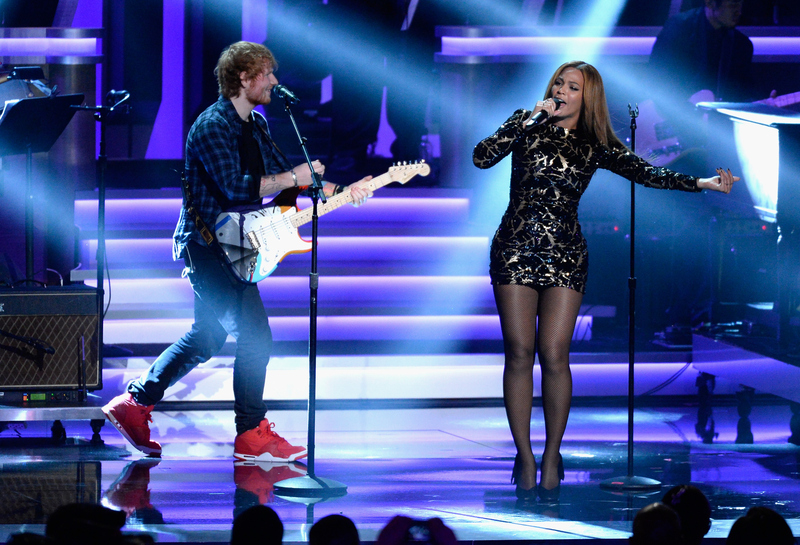 One thing is for sure: when it comes to amazing music, Ed Sheeran and Beyonce are definitely at the top of their respective games — albeit in totally different genres. I'm a big fan of both and have been for years, but admittedly, I would never put them together in any way, and I would totally never expect them to collaborate. That's why it was a bit of a surprise (an amazing one!) when Beyonce and Sheeran performed "Drunk In Love" together at the Global Citizen Festival held in New York City's Central Park on Saturday. Somehow, two artists who seemingly have nothing in common on the surface managed to make complete and total sense once they hit the stage together. Now that's talent! Sheeran has always been a fan of Bey's, of course — he covered "Drunk In Love" during interviews with Ryan Seacrest and Elvis Duran in the past — but it's unclear whether or not she felt the same. No doubt she's a fan after their collaboration, because it was totally magical. Of course, they're not the first unlikely duo to pair up to create musical genius, and sometimes it's the sheer unexpected-ness that makes them that much better. Here are seven other unexpected but totally amazing musical collaborations to sink your teeth into. Rihanna & Coldplay, "Princess Of China"
This is probably my favorite collaboration ever, and I don't even know why — maybe just because it's a damn good song? There's something about the way Rihanna sings the line "You really hurt me!" with such passion, or Coldplay's instrumentation... I don't know, but I love it. Kanye West & Bon Iver, "Lost In The World"
The last people you'd ever put together are Kanye West and Bon Iver, but somehow, it just works between them. Bon Iver's stark vocals work perfectly with Kanye's and the song is a modern masterpiece. I don't know if you can call it a true collab since it's more like Kanye sampling/mixing Bon Iver's song, but whatever, this is my list so it counts. Katy Perry & Snoop Dogg, "California Gurls"
I love Katy Perry and I love Snoop Dogg, so putting them both together is a dream come true. "California Gurls" is a really silly track, but it's a lot of fun, which is why Snoop rapping about how he loves West Coast girls is so hilariously appropriate. Alicia Keys & Jack White, "Another Way To Die"
This is a bit of a deep cut, since I don't ever remember too many people talking about it, even when it was brand new (or maybe I just wasn't paying attention). I don't know that this is my favorite song ever, but it's such a fascinating collaboration that resulted in something really intriguing and beautiful. Lady Gaga & R. Kelly, "Do What You Want"
Just when we all thought R. Kelly was starting to fade into obscurity, he worked with Lady Gaga and everyone was like, "Whaaaaat?!" "Do What You Want" is an empowerment jam, and also one about getting freaky, which is right up R. Kelly's street. Run D.M.C. & Aerosmith, "Walk This Way"
A total classic. Does it really need an introduction? These collabs prove that artists don't need to be known for similar music, or even exist on similar musical planets, to to make great music together.